Emory is piloting a new initiative this fall that uses mealtimes to foster increased engagement between faculty members and undergraduate students. 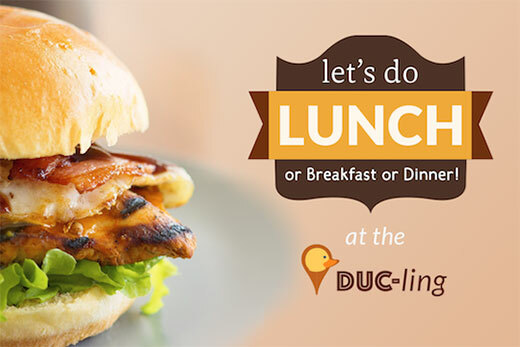 Let’s Do Lunch @ the DUC-ling! – an initiative of the Emory Undergraduate Project (EmoryUP) and Campus Life – began in October and will continue through the semester under the auspices of the provost’s Office of Undergraduate Affairs. The program encourages students to invite faculty members – and faculty members to invite students – to share breakfast, lunch or dinner at the DUC-ling. Meals for faculty will be complimentary, and students not on the Emory Meal Plan can also eat at no charge. Faculty from Emory College, Goizueta Business School and the Nell Hodgson Woodruff School of Nursing are encouraged to invite their students to share meals. From 8 to 10 p.m. is a great time for faculty who are advising labs, study groups or student organizations to go to dinner. For Chad Sunstein, director of Campus Dining, the program is a natural fit for the sense of community that Emory nurtures. “This is really a simple way of encouraging students and faculty to get together outside the classroom,” he says. The project, which operates on the university’s main campus, was conceived by Pamela Scully, vice provost for Undergraduate Affairs, and David Clark, associate vice president for Campus Life. Heather Mugg, associate vice provost for Undergraduate Affairs, worked on implementation with David Furhman, senior director of Finance, Administration and Operations. Scully and Mugg are pleased that their concept has come to fruition so quickly. “It’s been really a nice experience working with Campus Life and having a dining partner that’s been so supportive of what we’re trying to do,” Mugg says. When Scully took the idea to Clark, she says he was immediately supportive. Innovative ideas, according to Clark, don’t always have to gather dust before reaching implementation. The success of this test run could determine whether Let’s Do Lunch will continue into the spring and beyond. Campus Dining is collecting participation data, which program officials will analyze. Such impact-focused partnerships also are what senior leadership has in mind for how programs and departments within the university should work together, Clark notes. From his perspective, Sunstein considers Let’s Do Lunch an important stepping stone in expanding opportunities for undergraduate and faculty interaction.